July is festival time in Kataragama, the holy city in south Sri Lanka. It is one of the biggest religious festivals for Hindu devotees. Many Buddhists too participate in the fortnight long festival. The final night is the Maha Perahera when the main procession is held and the water-cutting ceremony is held the following morning. 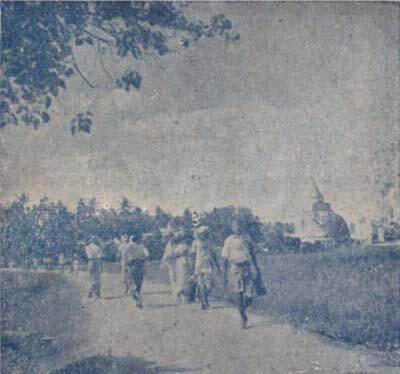 Although the Kataragama festival had been held for a very long time, even in the early part of the 20th Century, the trek to Kataragama was a tedious one. The area was covered by thick jungle where wild animals roamed. Malaria was prevalent in the area and at that time it was a deadly disease. "There is on the south-east coast of Ceylon a lonely hamlet known as Kataragama in the heart of a forest haunted by bears, elephants and leopards and more deadly malaria. The Ceylon Government thinks of Kataragama especially twice a year, when arrangements have to be made for pilgrims and precautions taken against epidemics. It is possibly because of these difficult and hard conditions that over the years the pilgrims were warned to be on their best behavior in the Deviyange Rata - the Land of the Gods. They were told that they should be extremely careful in what they do, what they say and even what they eat. No fish or meat is consumed during the pilgrimage - they all remain vegetarians. They had to guard their tongue and be mindful always that they were in god's land. The strenuous journey is also echoed in the popular saying Denagena giyoth Kataragama - Nodena giyoth ataramaga - 'if you know the way you will reach Kataragama - if not, you will be stranded'. The devotees developed a feeling of fear. With the development of a network of roads in the country, the trip to Kataragama gradually became an easy one. Yet the holiness attached to this sacred place did not change. The discipline continued to be maintained. 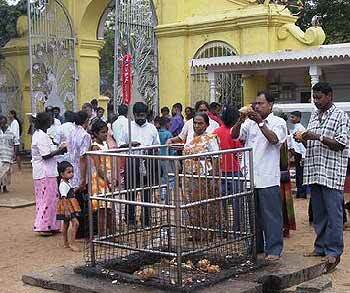 How did Kataragama become the land of the gods? Kataragama known to Hindus of Sri Lanka and South India as "Katirkamam" has a famous shrine dedicated to Lord Katirkaman. The presiding deity is Murugan or Skanda. God Skanda is considered Sri Lanka's guardian deity and is identified as one who can bring prosperity and protection.  As he is described in the popular Sinhala verse - Muhunu sayaki - ath dolasaki - Mayura pita vāhane - he possesses six faces and twelve hands and his vehicle is the peacock. He is depicted in this form in paintings and drawings. alongside the shrine and cleanse themselves. The water level is often very low and devotees can conveniently do a bath. 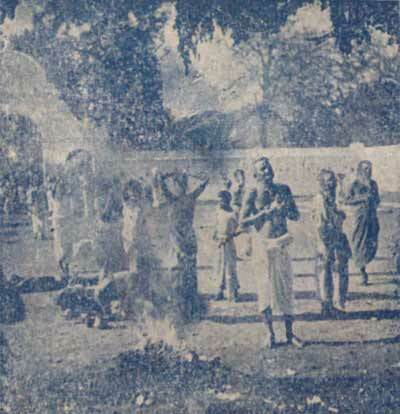 processions are held, acts of penance are performed by devotees and a fire-walking ceremony takes place. On normal days too offerings can be made to the deity at specific times during which the religious observances are conducted. 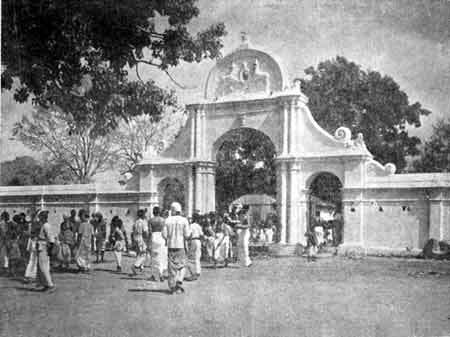 Devotees gather in numbers with baskets of fruits in their hands which are handed over to the kapurala - the lay official in charge - and his assistants all clad in white. The offerings are taken inside and a portion is returned for the devotee to consume. Ash is applied on the forehead of each devotee who also picks up a little coconut oil from the tall brass lamps and applies on the head. The oil is taken home to be applied later since many believe this oil helps to cure illnesses. It is with a great sense of relief that devotees get back home. They return with a feeling of satisfaction that they have been to the god's country.